Fifteen minutes from downtown Los Angeles, just 100 feet away from a major freeway, a small city lot was transformed into a mini paradise. 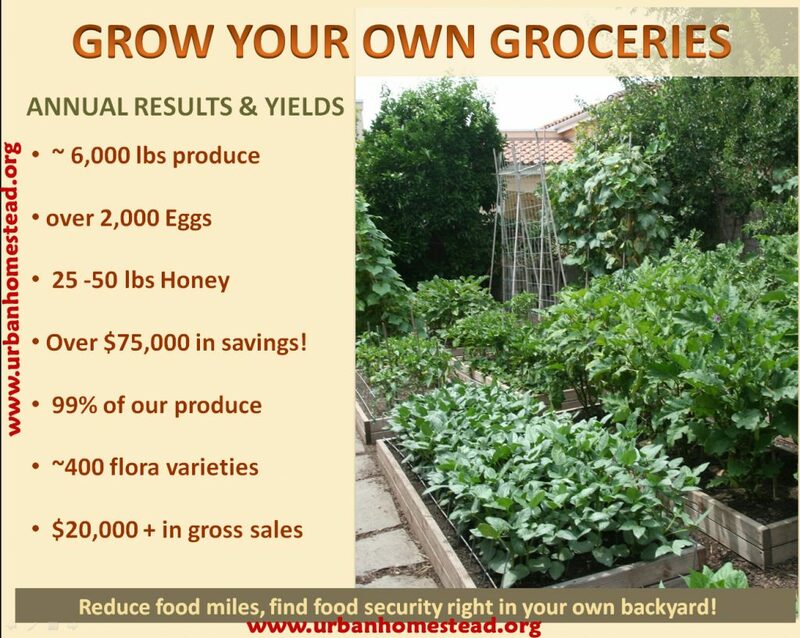 A fifth acre lot, minus the house, garage and driveway, the family has converted the remaining tenth of an acre into a tiny food forest that produces 7000 pounds of food per year with no synthetic fertilizers. What’s the secret to their abundance? 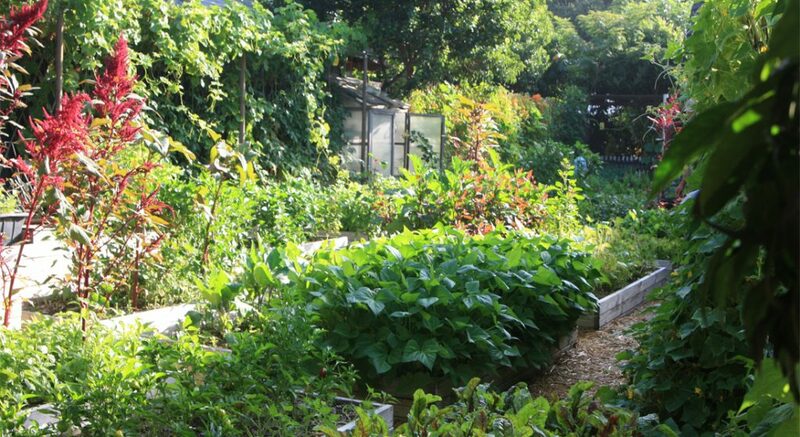 Permaculture methods that mimic Mother Nature to create nutrient-and-bacteria-rich soil. Conventional agriculture methods strip nutrients from the soil until the land becomes barren and desertified. Permaculture not only does not strip the soil, it regenerates it, says permaculture guru Toby Hemenway. When Jules Dervaes moved to his Pasadena home in the 1985, there was no soil, only adobe-like clay. He and his family spent years bringing the earth back to life with rock dust, chicken and goat manure, fermented compost and effective microorganisms. The Dervaes’s haven’t used organic NPK fertilizers since 2007, and have never used synthetic NPK. In square-inch gardening plants are packed as closely together as possible to prevent evaporation from the soil and save water. The Darvaes believe soil should never be bare and exposed to the elements. They ignore the spacing recommendations on seed packages and sew them as close together as possible in symbiotic arrangements. 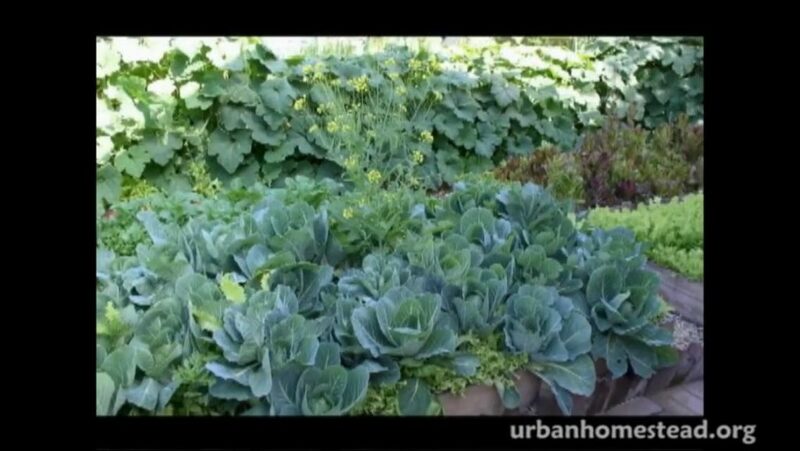 “Bigger vegetables like broccoli or peppers are planted with a carpet of greens – lettuce, arugula, etc., underneath … the green carpet acts like a living mulch, preventing weeds and keeping the soil moist,” it says on their website UrbanHomestead.org. Not only does this make the most efficient use of space, it requires less maintainence. As the Darvaes’ write “no rows, no hoes.” Everything is done by hand, except for one of their favorite tools, a soil-block maker. This allows them to get new seedlings started in blocks of soil, ready to replace annual crops as soon as their season is up. Path to Freedom founder Jules Dervaes said he knew he wanted to be a back-to-the-lander eversince the Vietnam War. He had no idea his revolution would begin in Pasadena, California. He didn’t intend to live in the fixer upper house he bought there forever but a severe drought in the 1990s triggered him to start the garden that kept him there. Darvaes says he was just “fiddling around” until he learned GMOs had entered the food supply in 2001. After that he “went a little crazy” and decided to find out just how much food his little plot could grow. He wanted acres, but couldn’t wait for that and decided to work with what he had. “Dad started taking over every square inch, horizontal, vertical, the frontyard, the backyard and the driveway,” his daughters Anais and Jordanna say in the video above. There were no models to follow, we just did it,” said his son Justin Dervaes. “I believe growing food is one of the most dangerous occupations on Earth, because you’re in danger of becoming free,” the now deceased Jules says in the video. The family also makes their own biodiesel and their home is almost entirely solar powered. They use goat and chicken manure. Probably sends all unused green waste and coffee ground to a compost pile then uses this is part of the system. This will also create a good earth worm family that will supply a lot of worm castings for the soil. Worm castings can also be used to make worm tea to be used as fertilizer. MMm… nothing like a cup of nice warm worm tea in the morning. The myth surrounding vegetarianism. 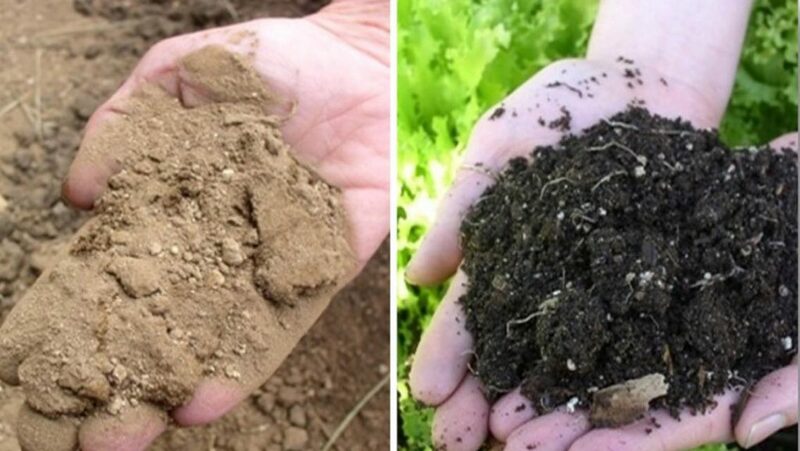 Soil needs rotting animals and their waste to be biodynamic. they eat a vegetarian diet which consists of eggs and milk from goats. That means they have animals living on their property as do most permaculture set ups. How is this a myth? Vegan is different to vegetarian. You can have animals, and use their manure without eating them. You don’t need animal waste to keep a healthy soil. Manure contains a lot of useful bacterias which can speed up the process, but it’s not necessary. You can get all the nutrients and microorganisms from plant waste, rock dust, seaweeds etc. If you insist on using animal waste you can always use horse manure, or sample from wild animals. Or use your own toilet waste for that matter, if you follow certain hygienic principles. But I cannot see how this would contradict a vegan lifestyle. You can also use Humanure. Love this idea. May try it on a smaller scale. Would uh be interested in trying a free sample of our pure organic Sweet Leaf Worm Castings? We’re OMRI certified. I would love to to try it. I am very interested in trying a free sample our your pure organic Sweet Leaf Worm Castings! Please let me know how I can obtain the sample. love to try your worm castings. I used to live in the Driftless of Wisconsin. Now in the burbs of the Twin Cities. How can I get some? We have an organic garden that we built in boxes to take over the back yard. We love it and it provides food for us and others. excellent job.please send me more information about Permaculture at my email. Fantastic! I’ve always thought that lawns are a complete waste of water. I’m integrating vegetables into the landscaping but i’m not nearly as accomplished as the Darvae’s. Great article, Sarah. I loved the video. It made me want to do the same. Interesting Colleen. Do you have a website showing this concept? Thanks Sara, love this story and many of your others! Keep up the good work! 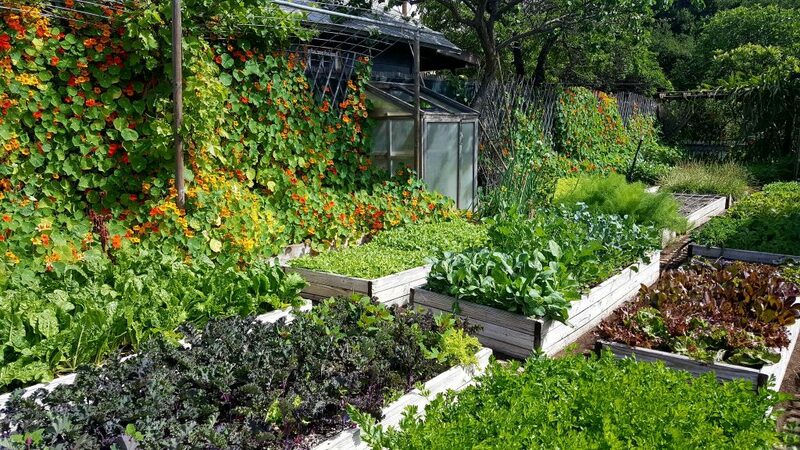 so nice to see such farming (kitchen garden) am also into gardening but i want more tips or knowledge about permculture farming. nice for the great work done. Can I come visit your place with my teens to incourage them to turn our backyard into paradise like yours. Just what we need at the beginning of the gardening season, thank you! Fantastic! How do you get started? I see you have raised beds, what kind of wood did you use to make them? I would want something that would last and not rot but I wouldn’t want the chemicals of treated lumber. What do you suggest? From observing ants making nests on the backsides of pressure-treated plywood I’ve concluded the chemicals don’t affect soil that much. If it takes pressure to drive the chemicals into the wood it might take pressure to drive it out. I would like to try it. I have land n the desert. 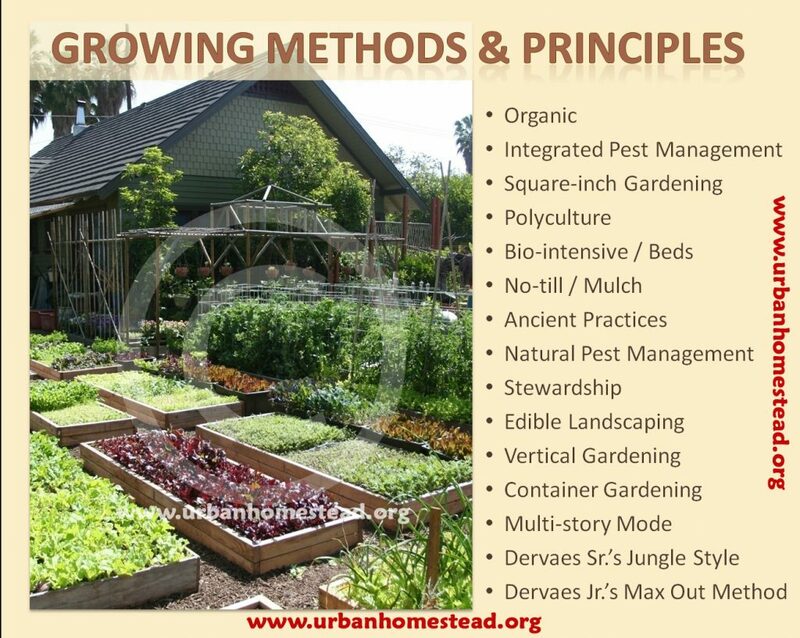 I love the way that Permaculture has claimed this successful gardening model. I have followed this family from the beginning and I am pretty sure the garden was not built on Permaculture principles, just a man with a lot of common sense. Hands off Permies. Please send me more about permaculture on my email bmukeza@gmail.com. Do you every open your garden up for fieldtrips/workshops? 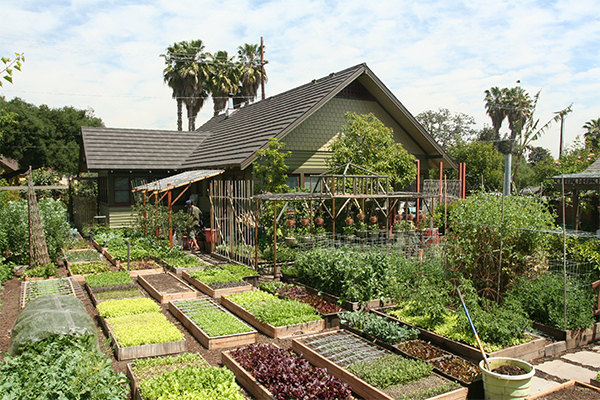 We have a group if homeschool families that woyls.live yo Learn more about permaculture! This should be widely advertised in Thailand too as some people greatly oppose this out there, not understanding the benefits of this kind of farming. My son bought land out there and tried but there was great opposition! I liked this project and I think it’s the way to go especially with urban dwellers. Anyone found a pdf of this book. Really like how you leave no soil bare. This is key to replicating nature. A happy moist, weed free enviroment for plants. Inspiring as this this, it isn’t happening in the subarctic, with its 7-month-long winters, and deep, deep subzero winter cold, and it’s not happening in the Cool Temperate Rainforest of the upper Northwest coast, either, with longer summers than mainland Alaska and Yukon, but much cooler summers, with many fewer growing-degree-days. You simply can’t beat latitude. Would a type of summer house” be doable. I would be interested to know what foods you still buy? I know he doesn’t use fertilizer but he can’t be organic if he is 100 feet from a major highway that is high in fluorocarbons. Just saying…. I would like more information on organic pest management. What did Jules die from anyway? I’m gone to tell my little brother, that he should alsxo visit this web site on regular basis to get updated from newest news update. Would love to know more about their irrigation methods and their water bill. Approx how many manhours per day is devoted to irrigation? Inspiring farm. We pulled 1000 lbs of produce last season with only 4 (large) raised beds using a similar premise. We had way more than 2 people could need and sold a good bit too. It does work, just takes some time and study to figure out what works well together. Planting close together kept the soil damp and cool this summer and reduced the water consumption to next to nothing. How in the world do you keep critters from eating your crops? Most of my veggies end up being eaten by rats, squirrels and bunnies. I would love advice! My best to anyone who eats organic and likes to farm.. I’m retired now and having grown up on a farm appreciate good quality , whole food. Weather is everything if things grow or not so where I reside a green house is more advantageous . I also buy organic. It makes a BIG difference on how you feel long term. This gentleman died. I can only assume his three children are continuing his legacy since it was a joint venture. I find this amazing! I would like this book. Is it still in circulation?